Juventus dropped points for the first time in the season, following a 1-1 draw at home against Genoa this Saturday evening. The Bianconeri grabbed the lead in the first half thanks to a goal from Cristiano Ronaldo, but the visitors got the equaliser later in the second and managed to hold on to the draw. After 8 straight wins in the league, Juventus were finally unable to grab the 3 points and extend their perfect record. 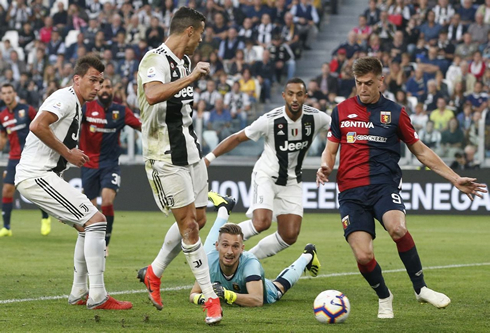 The Italian champions hosted Genoa and couldn't get a better score than a 1-1 draw this Saturday evening in Turin, in a game where they were heavy favorites coming into the game. Massimiliano Allegri's men looked a bit more rusty than in previous weeks, probably because of the international break we've been through and that has led to a lot of players making multiple flights in the past few days. One player that was spared from those disturbing routines was Cristiano Ronaldo, who stayed in Italy training with the club and ended up being the goalscorer for Juve this weekend. Despite the proximity of their game against Manchester United, Juventus lined up a quite strong team for this clash against Genoa, with Szczesny in goal and a back four with Cancelo, Bonucci, Benatia and Alex Sandro. The Bianconeri's midfield was formed by Matuidi, Pjanic, Bentancur and Cuadrado, while in the attack Cristiano Ronaldo was accompanied by Mario Mandzukic. It took less than 20 minutes for the home side to break the deadlock and it would be Cristiano Ronaldo the man with the last touch. The attacking play started on the left side with the always dynamic João Cancelo, who took on a defender while cutting inside and then saw his shot being deflected and falling into Ronaldo's feet on the far post. 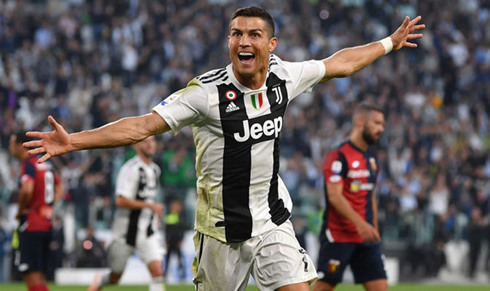 The former Real Madrid forward had no trouble in slotting it home and Juventus were happy to grab the lead so early in the game. 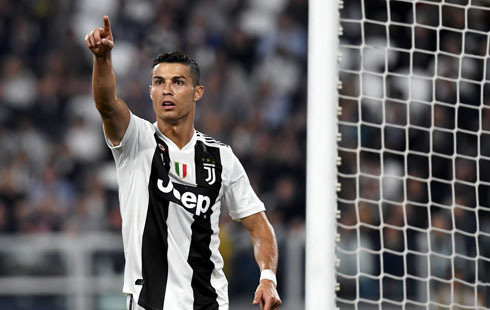 It was Ronaldo's fifth goal in the league this season and he's now in third place on the top of the goalscorer standings, with one goal less than Napoli's Insigne and four goals behind Krzysztof Piatek from Genoa, who couldn't score this Saturday at the Allianz Arena. As usual, whenever the dominating side is unable to extend their lead, sooner or later their opposition starts gaining some momentum. Juventus had plenty of chances to go up by two goals, but for one reason or another they failed to convert their opportunities and the visitors would capitalise on that. After a few threats coming mainly from Genoa's main man Piatek, the "Rossoblu" were able to finally score the equaliser in the 67th minute of the game, when a perfect cross from Kouamé met Daniel Bessa's head in a privileged position. Juventus' defense was caught completely off guard, as several players had turned their back to the ball thinking it was going out of bounds. 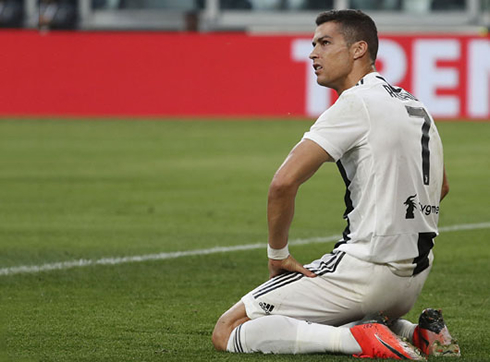 Even though there was still plenty of time left for Juventus to go after a second goal, the truth is that the hosts struggled a bit to push Genoa back into their own box and create clear-cut changes to go in front again. Ronaldo had a good header straight after the equaliser but saw the ball going wide, just like Dybala's shot missed the target by a few inches already inside the last 10 minutes of the game. Juventus dropped the 2 points but are still on the top of the league, 4 points clear of Napoli. Next Tuesday they travel to England to face Manchester United for the Champions League, in a game that promises a very special atmosphere for Cristiano Ronaldo's return. Cristiano Ronaldo next game for Juventus is on October 23 of 2018 against Manchester United. You can watch Manchester United vs Juventus, Real Madrid vs Viktoria Plzen, Barcelona vs Inter, Everton vs Crystal Palace, Inter vs AC Milan, and AEK vs Bayern Munich, all matches provided from our live soccer game pages.